buildOn students at Stamford High School and Westhill High School in Stamford joined other community organizations to march in honor of Dr. Martin Luther King, Jr. The march’s theme was civil rights and women. The students carried posters with their favorite quotes from Dr. King and participants focused on peace building and creating trust between community members and police. “It’s better to spend the day helping out others than staying home and doing nothing,” Bassick High School senior Eddie Vega said. A number of other students shared the same sentiment, opting to make an impact in their neighborhoods or having meaningful conversations with community members over playing video games or watching television at home. 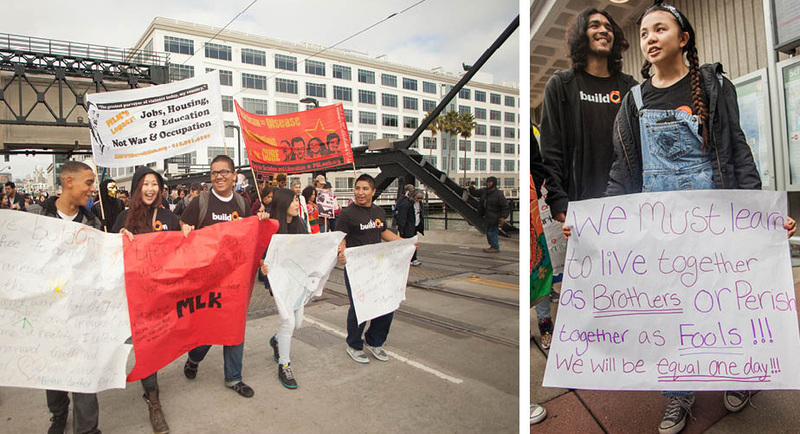 Bay Area students participated in a city-wide march in San Francisco to commemorate the 50th anniversary of the Selma to Montgomery march led by Dr. King in 1965. Benjamin Pablo, an 11th grader at Oakland High School said, “I went to the MLK March not just because I care but because I want to see how many people actually want to make a change. I do service because I got tired of waiting for the change, I wanted to be the change.” Students from buildOn schools in San Francisco and Oakland came together for the march with thousands of other people from their community. Ken Nguyen, also in 11th grade at Oakland High School echoed similar sentiments. “I believe we can make a difference in our community. I hope we can continue doing service because service is what we can do to change the world,” he said. 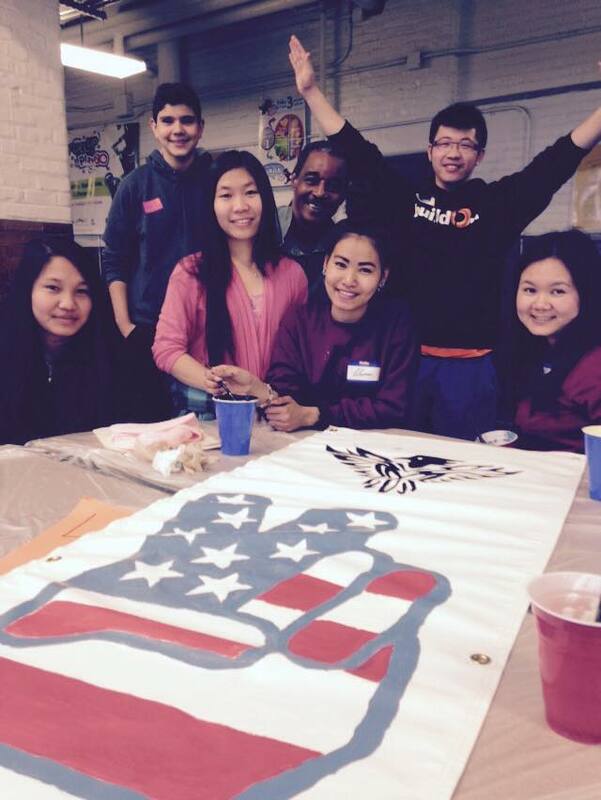 buildOn’s Boston program celebrated Martin Luther King, Jr. Day with three hands-on service events. They prepared, served and shared a meal with homeless veterans in Boston at the New England Center for Homeless Veterans. They also joined in youth events, attending the Massachusetts Promise Fellowship Annual MLK Day Youth Event at Northeastern University and a day of service supported by Many Helping Hands 365 in Cambridge, MA. Students made blankets that will be donated to elderly in need, supported a local community organization in creating pamphlets and led social justice workshops. Ameina Mosely, a senior at the Community Academy for Science and Health, led a “Knowing Your Rights” Jeopardy game. Ameina noted that it is important to do service on Martin Luther King Jr. Day because it gives students and opportunity to contribute to his legacy and share his history. buildOn students from several Bronx high schools joined together for a collective project at the Hunts Point Recreation Center in the Bronx. The schools hosted a children’s fair and organized activities and creative art workshops for community members. Members of the buildOn program from Brooklyn participated in a day of service and workshopping with area middle schools students. They touched on important topics including gang violence, human trafficking, police brutality and peace, and the roles that young people can play in making change within their own communities. “I really liked the MLK Day Children’s Fair… because a whole bunch of people who have their own lives and things going on just stopped everything for a few hours to be with this community. The kids that came were so cute and really needed our guidance. It felt good to be there for them,” Mott Hall High School senior Nubia Fields said. 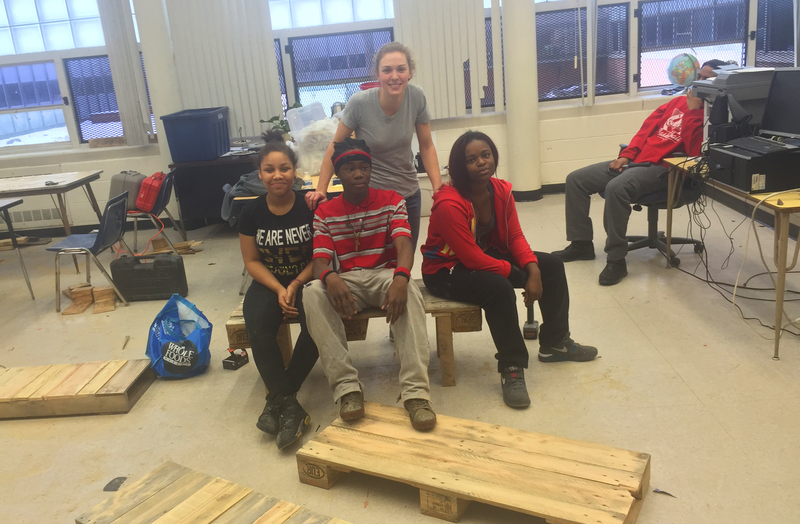 buildOn’s students in Philadelphia participated in a number of large scale beautification programs within their community and schools. At Furness High School, students worked alongside volunteers from the British American Business Council (BABC) to beautify their school. Approximately 50 volunteers repainted two classrooms and multi-cultural and inspirational murals throughout the school’s hallways. Students taught members of the BABC about buildOn and shared reflections celebrating the impactful service the students do throughout the year. 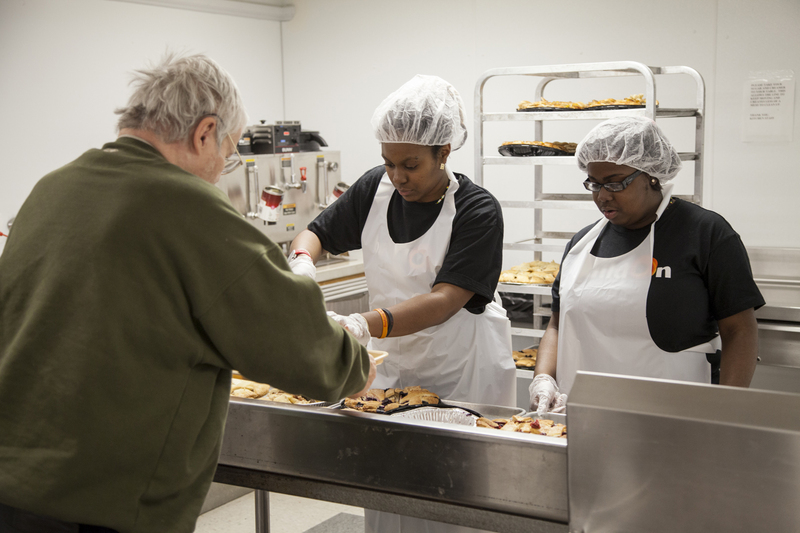 Bodine and Delaware Valley Charter High Schools also hosted a hallway and mural painting projects on MLK Day and served a meal at a homeless shelter over the weekend. buildOn students at West Philadelphia High School honored Martin Luther King Jr. through programming that combined both creativity and consciousness. Poetry, music and other artistic performances were shared alongside a poignant panel discussion about making change in the community. 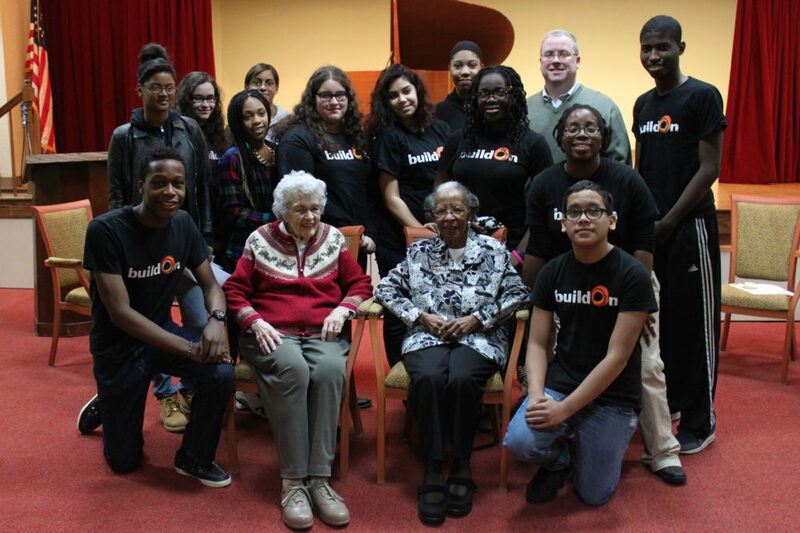 buildOn students led the event, which was attended by people from throughout the school and wider community. Following the program, attendees joined together at the nearby West Park Housing Development for a painting and beautification project. Students offered powerful reflections on Martin Luther King, Jr. Day, service and non-violent activism. Refatun Momo, senior and student secretary for West Philly’s buildOn program, spoke on a panel at the event. It was her first time speaking in front of her community. She reflected on what it means to impact one’s community and to stand up against injustice. Thank you to staff from buildOn’s youth service program for their contributions. Photographs contributed by Director of Digital Marketing Brandon Worth, Program Coordinator Rohanna Wagener, Digital Storyteller Lauren Manning, Graphic Designer Srijan Tamraaz, Program Manager Betsy Rivera, Program Coordinator Jon Mucciolo, Program Manager Crystal Collins, contributing photographer Mason Marino and support from contributing videographer Rossi Brooks and Unique Video. Reporting by Lauren Manning and Brandon Worth.